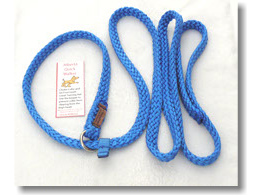 This leash is ideal when used with large dogs in heavy traffic areas. 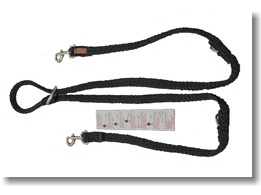 The leash is doubled the entire length for strength, and has a nickel-plated bolt-snap at one end, and an ample hand loop at the other. This product is available in 1" width only. 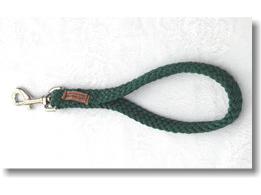 These leashes are four feet in length with a nickel-plated bolt-snap at one end, and an ample hand loop at the other end. Available in 1/2", 3/4" and 1" widths. 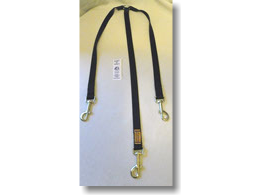 These leashes are six feet in length with a nicel-plated bolt-snap at one end, and an ample hand loop at the other end. Available in 1/2", 3/4" and 1" widths. These leads have a loose weave that is both strong and easy on the hands. Available in 4 foot and 6 foot lengths. Colors available: Black, Red, Royal Blue, Pine Green, Purple, Teal, Burgundy, Pink, Gold, Red & White, Red/White & Blue, and Black/Purple & Teal. 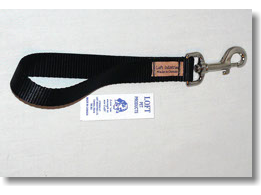 With an overall length of just 9", this product is great to keep your bigger dogs ultra-close in traffic areas or at street corners. Colors available: Black, Red, Royal Blue, Pine Green, Purple, Teal, Burgundy, Pink, Gold, Red & White, Red/White & Blue, and Black/Purple & Teal. This is a handy collar and leash in on. 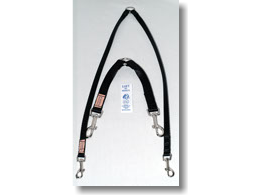 Based on the design for choke collars it also has a 6 foot lead built right in. Makes a great training aid. 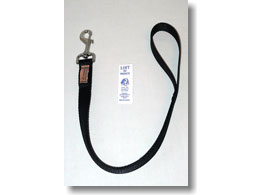 Also great for dog groomers, veterinarians, and dog walkers. Colors available: Black, Red, Royal Blue, Pine Green, Purple, Teal, Burgundy, Pink, Gold, Red & White, Red/White & Blue, and Black/Purple & Teal. This is a true multi-function lead. This lead can be configured to be the following: 1) Six foot lead; 2) Four foot lead; 3) Three foot lead; 4) Tether lead; 5) Shoulder lead; 6) Twin walker. Colors available: Black, Red, Royal Blue, Pine Green, Purple, Teal, Burgundy, Pink, Gold, Red & White, Red/White & Blue, and Black/Purple & Teal. These great little items are only four inches long. Big enough for an easy two finger grasp. The other end attaches to the collar with the bolt-snap. Available in 1/2" width. 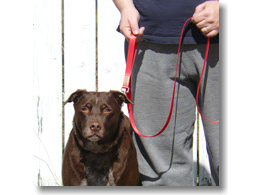 This product is useful for training all size dogs and also for walking taller breeds. The Training Handle is basically a hand loop with a bolt-snap on the end of it. Overall length of the product is 10" and is available in 3/4" and 1" widths. 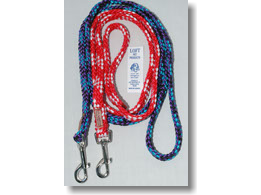 This is a mini version of the braided Canadian Lead. Another true multi-function lead, this lead can be configured to be the following: 1) Six foot lead; 2) Four foot lead; 3) Three foot lead; 4) Tether lead; 5) Adjustable waist or umbilical lead; 6) Twin walker. 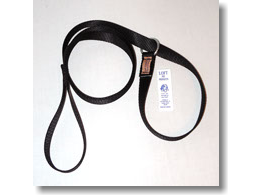 Made from 1/2" nylon webbing. Available in standard colors and patterns. 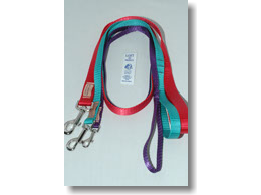 These leads are great for high-traffic areas, street corners, or any situation where you need to gain quick control of your dog. Suitable for medium and large sized dogs. Available in 3/4" and 1" widths and 6 feet in length. Available in standard colors and patterns. 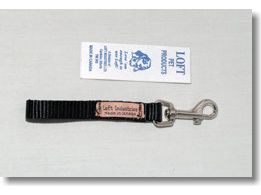 These leashes are great for professional dog owners/handlers, groomers, veterinarians, etc., or for a quick-use lead. They are basically a six foot leash with a choke collar on the end. Available in 1/2", 3/4" & 1" width. 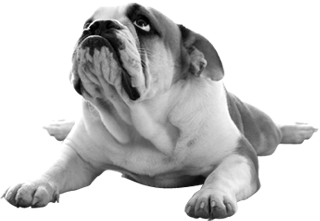 These couplers are ideal for pet owners who have more than one animal. Simply attach one bolt-snap to the collar of each animal and attach the bolt-snap of your leash to the ring in the center. You can now control two animals with one leash. Available in 1/2", 3/4", & 1" widths. Colors: Black, Red, Royal Blue and Pink. 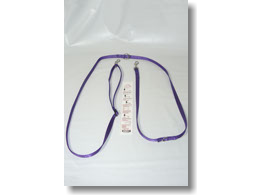 Now you can walk three dogs on one leash or Flexi. Made with the centre strap 4 inches longer. Available in Black only.